Today is cleaning day. Things would be going a lot faster if I weren't coming across so much great stuff that I enjoy thumbing through. Today I'm featuring a photo of my grandpa, Jim Corley, holding what appears to be a kangaroo. I had never seen this photo before today, so you all are some of the first to see this one. Where he is and what he's doing with it, I haven't the foggiest idea. Too bad you do not know where he is the grandfather, but it is a beautiful souvenir pictures !!!!!! I think it is a Spanish goat. But I really don't trust my 71 year old eyes too much anymore. I also see a Shepard but a German one not the one RTD sees (smiles). Hmmm, maybe it is a dog. Certainly would make more sense. The ears are not what I'd expect of a GSD pup but it certainly is not a joey nor is it a goat -- the feet look like a dog. I think it is a goat. The breed I believe is alpine. Jerry, I think you got it. The ears are the clue. Now Nate needs to try to find the rest of the story about his grandfather. Where, when, etc. I would love to see the rest of the story. I'm pretty sure its a dog. There are definitely paws on the front legs. He looks like he's dressed as a Canadian Mounty? So, Nate. It appears that you have just started a new game. Name that Mystery Animal. A warm smile spreads across my face. 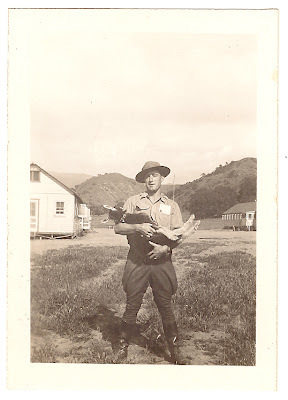 We have a photo of my husband holding a dog, similar to your pose. I had better go find that photo and write on the back. hmmm, maybe I'll write kangaroo.